How to setup Netbeans IDE to debug Maven JavaFx project on Raspberry remotely? How to work with energy model in ns3 as in ns2 for energy modifying protocol as energy aware? I have setup ad-hoc network via Wi-Fi on Three Raspberry Pi3 and it is working fine. I call them Node1, Node2, and Node3. Node3 is mobile node(a moving node) which will connect to nearest Node. Now I want my mobile node to connect to nearest Node which is in the range of Wi-Fi signal and if both are in range then connect to Node which has the strong signal strength. I also need to get the node name when connecting to it. I'll be very thankful in advance. I'm trying to develop a system operating on raspberry pi that will log data from multiple sensors (specifically distance measurements @ 25 samples/s and GPS NMEA sentences at 1 sample/s) at different rates, and perform some analysis on this data - so I'm dealing with a continuous time-series. If a certain event is detected from this data analysis, an event should be logged. In addition to this, a camera is operating, and should produce video corresponding to the event (~4 seconds in length). Ideally further analysis would be conducted on the video produced, but I might be hitting the limits of the raspberry pi hardware so this could be conducted once recording ends. I'm trying to think about the broader architecture but I'm out of my depth, don't know the unknown unknowns, and would appreciate some suggestions on ways that you might approach this. Does it make sense to do all of this (logging + data analysis etc.) in one script using lots of threads/processes, or is it likely to be better to break the task into a number of different scripts that interface with a database? I see this option as becoming quite convoluted and difficult to code and debug. I'm assuming I would also need to prioritise tasks to ensure data logging doesn't come at the expense of downstream analysis. Does it make sense to use a relational database to log data to a table for each sensor, and a table for events? What tools exist to conduct this sort of analysis for a pipeline with continuous real-time data? e.g. with rolling windows built-in. I'm convinced they exist, but I don't know what is suitably lightweight to run on a raspberry pi. I am trying to read a photosensor (light sensor) by polling it. However, even though I wait 1 millisecond before polling it again. How do I fix this? secs_left = "Ball detected. You have " + str(int(((t1+10000) - current_time)/1000)) + " seconds left"
Sorry for the long code. I hoped the sensor would detect the ball, but it didn't, leading to a detection failure. How do I fix this? I want to debug and run my Maven JavaFx project on Raspberry pi 3B+ from my workstation. I've tried Maven with Standard Java application and JavaFx application without Maven, in both situation it works successfully. But when I try with JavaFx Maven it gives me an error. I'll be setting up an webapp with Flask in an old Raspberrypi B+ running raspbian. The pi will also handle the desktop fuzz, so I'll try to keep it as light as possible. The point of this question is mainly 1- what DB should I use? But I'm also wondering if 2- keeping it in a external usbstick would help? Let's take it step by step. Low overhead, the pi will most likely struggle, I'm just trying to minimize it. The second point is about sd cards burnout. I read somewhere that any db should hit sd cards pretty hard and it got me thinking. I'll set up some kind of external backup to this db anyway, but should I also keep the path to it in an stick? This should be really simple if I choose to use SQLite. I have changed my default download location in chrome://settings, and when running Chromium on my Raspberry Pi, that setting saves on restart, but when I boot straight to Chromium in kiosk mode, the default download location changes to /tmp/downloads. If I boot into kiosk mode, then go into the Chrome settings and change the default download location, on reboot it resets to the same /tmp/downloads. Is there is a file I can edit, or a command line edit I can make to keep my settings more permanent? Headless Pi3, Android Things, running an irrigation app, connecting through wifi to provide a user interface through Nanohttpd. I should mention that the app is only for personal use on my pi - I am not trying to market it or run it anywhere else. I have previously written about my irrigation app failing once a day or so without pertinent error messages. I have realised that it is because I have been using an unsigned apk for testing purposes, and I have now read that a time limited signature is added in the process. My app dies when it reaches the time limit. So I have been trying to install a signed version and have failed so far. I have uploaded a signed version to the Things console, and used this to generate a custom build. When I put the sd card in my pi, the app runs, but I don't get the chance to input the wifi connection details. I have tried to make my app not the default app, in the hopes of seeing the Things toolkit on boot, so I can input the wifi details. I haven't succeeded at that. and adding wifi/network permissions to AndroidManifest.xml but the app runs only briefly and I lose the wifi connection. I have tried installing the signed version through Android Studio, but I get 'Password verification failed'. I have tried Cleaning and rebuilding the project. and in the Things Console, I have ticked these permissions in the build process. I don't know what to try next. Any help much appreciated. I am using Raspberry pi 3B+ and python 2.7.
hope you guys can help me. I searched a lot but was not able to find a solution for my problem. With isolcpus and the taskset command I isolated two cpus for my pyhton script to avoid longer cycle times caused by the operating system. Receiving and sending some bits via the GPIOs of the Raspberry with a 2ms cycle time is my first task and works fine now. 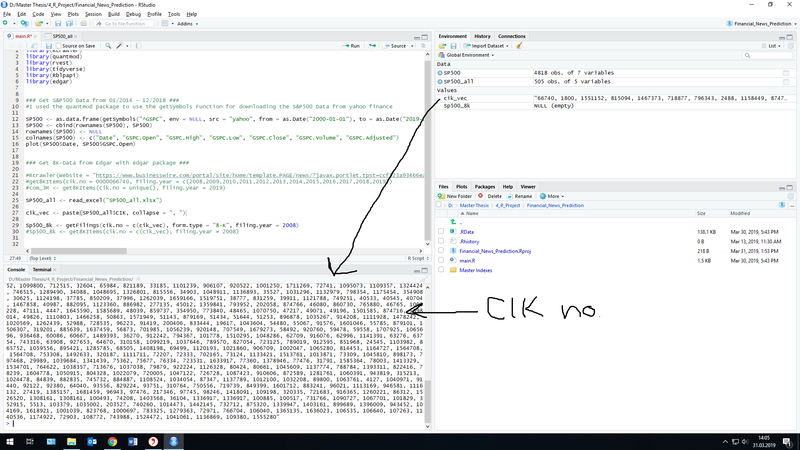 The second task is to read and write the information to a MySQL database, which is not time critical (the database connection works fine already). I therefore thought of using a queue which could be the connection between my fast task and the slow database-task. I want to assign the fast task to one cpu and the slow task to the second cpu (both cpus are isolated). How can I accomplish that? I need two queues (Transmit, Receive) to communicate. I was not able to find a way to communicate between two processes in both directions. I also thought of using two different scripts that i can add to a cpu independently, but here is again the problem of communicating between those scripts. I am trying to crawl the Edgar website through the Edgar package in R (RStudio). The package provides a nice function called getFilings(cik.no = c(cik_vec), form.type = "8-K", filing.year = 2008). So I am trying to download all 8-K fillings from the used CIK number of the companies which are saved in cik_vec. The download starts but I am getting this error: No filing information found for given CIK(s) and Form Type in the mentioned year(s)/quarter(s). So I think some CIK numbers do not have fillings and that's why the whole process is not successful. How can I solve this problem? The CIK numbers refer to all companies of the S&P500. After going through some examples and number simulation, I was not able to implement the energy efficient routing on ns3 like I performed in ns2. An energy model has been implemented in ns2 (ns2 energy model) but is yet to be implemented in ns3. Is this true? Or is the documentation not updated for latest version of ns3? if a protocol is energy-aware, i.e. its operation depends on the energy level, it cannot be effectively simulated without an energy model. I was able to perform the energy aware simulation on ns2 by modifying the aodv source file. When I tried to perform a similar simulation on ns3 with a similar modification it somehow didn't work. How can this be done on ns3? I would like to know if there is a way to add queue size to our adhoc network. I have a very simple case with two nodes, one sink and I would like to add queue size to both transmitter and receiver and simulate results by increasing transmission rate.